Kangchenjunga and its immediate satellites take the form of a giant cross straddling the borders of three countries, Nepal, Tibet and the once independent, but now Indian, state of Sikkim. 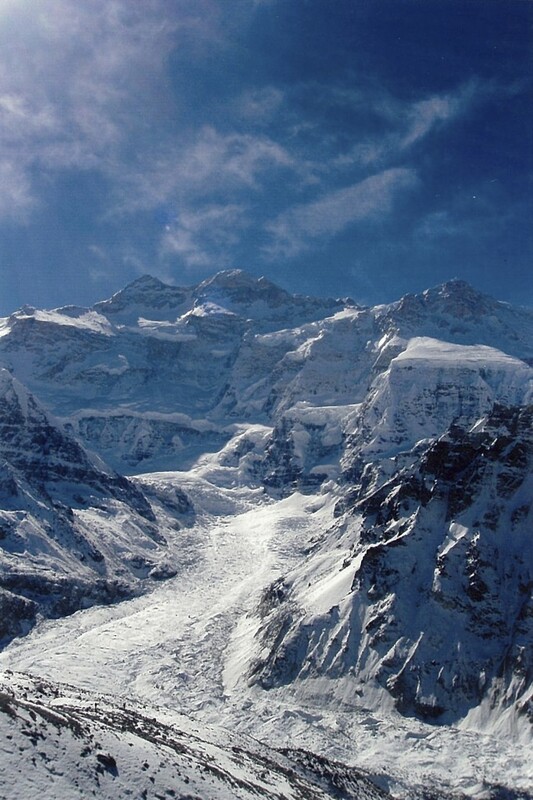 The massif is isolated from any other Himalayan mountain group and, until 1849, Kangchenjunga was thought to be the world’s highest mountain, but today’s accepted height of 8,586m ranks it third behind Everest and K2. 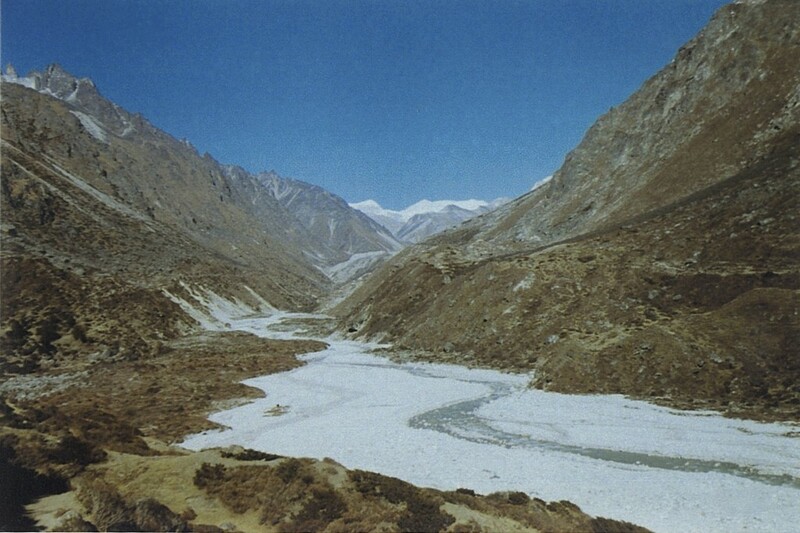 This great cluster cradles five major glacial systems, three of which lie to the east of the massif and flow into Sikkim, eventually feeding the Tista River, while to the west, in Nepal, the Kangchenjunga and Yalung glaciers form the major sources of the Tamur River. 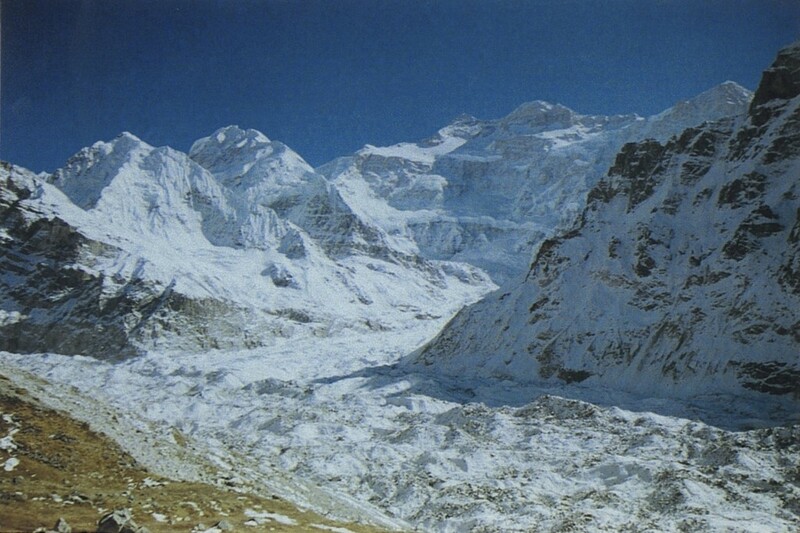 This intense glaciation is caused by the very high levels of precipitation to which Kangchenjunga is subjected. The combined effects of its considerable height and isolated location, southeast of the main Himalayan chain, leave it totally exposed to the full force of the advancing monsoon originating in the Bay of Bengal in early June. Even when the monsoon finally withdraws, towards the end of September, Kangchenjunga is slow to lose its veil of cloud and submit to the drier and more settled weather patterns of autumn. 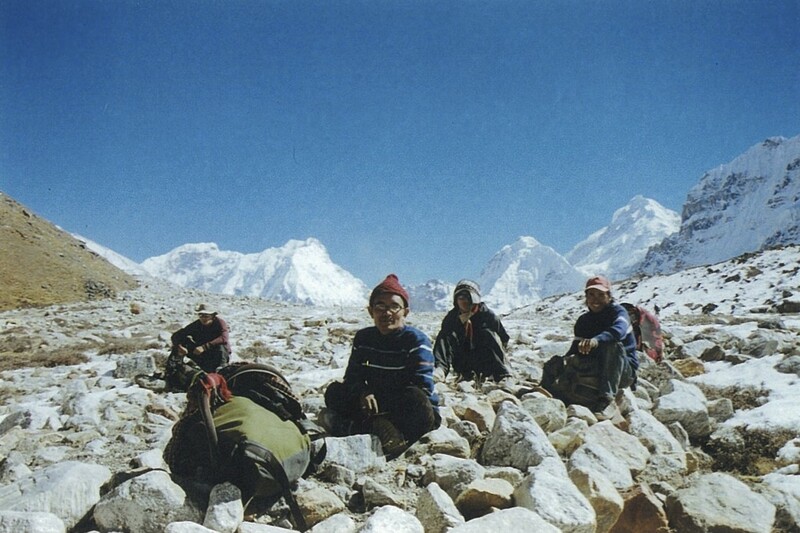 Only since 1988 have a limited number of trekking parties been allowed to explore the mountain’s immediate environs. This isolation has undoubtedly made a significant contribution to the preservation of the region’s flora and fauna; Eastern Nepal is of great interest to botanists and many new species are still being discovered in the vast forests and remote valleys. 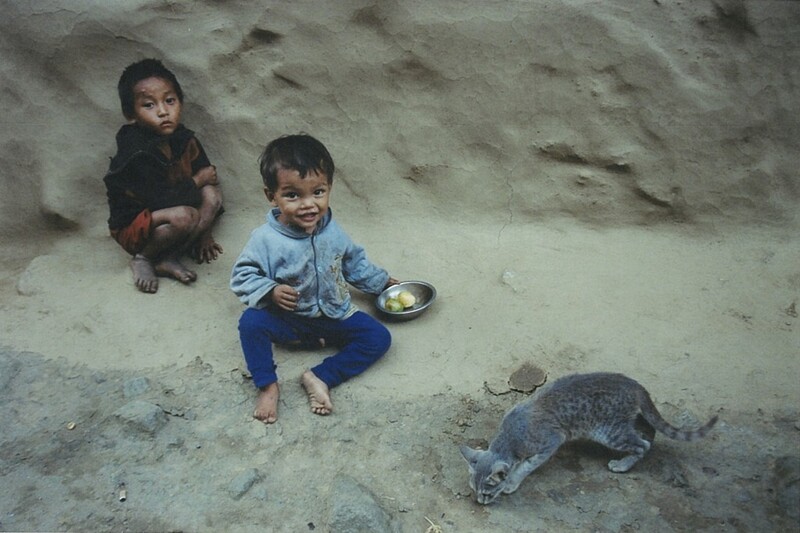 Cultures have also been preserved in the tiny hill villages that are inhabited by Rai and Limbu farmers. This is a highly recommended camping or tea-house trek, you won’t meet many other trekkers and you’ll have fun hiking across those passes. This trek can be done in either direction, we have published the detailed itinerary for the anti-clockwise route that treks to the southern base camp beside the Yalung Glacier before trekking to the northern base camp beside the Kanchenjunga Glacier. Recommended travelling times are during October and November or March to April or early May. Though we have scheduled a 25 day trek it could easily be done in 23 days, by reasonably fit people, with a bit of tweaking. This is a challenging trek. Day 1 Fly to Biratnagar Your trekking guide will come to your hotel and, after breakfast, we fly over the foothills of the Himalayas with views of the main peaks to the north. We will be met at Biratnagar by our trekking crew and transfer to a local hotel. Day 2 Fly to Taplejung (1,800m) and trek to Tabawa (2,000m) Another exciting flight (and landing) over the foothills. 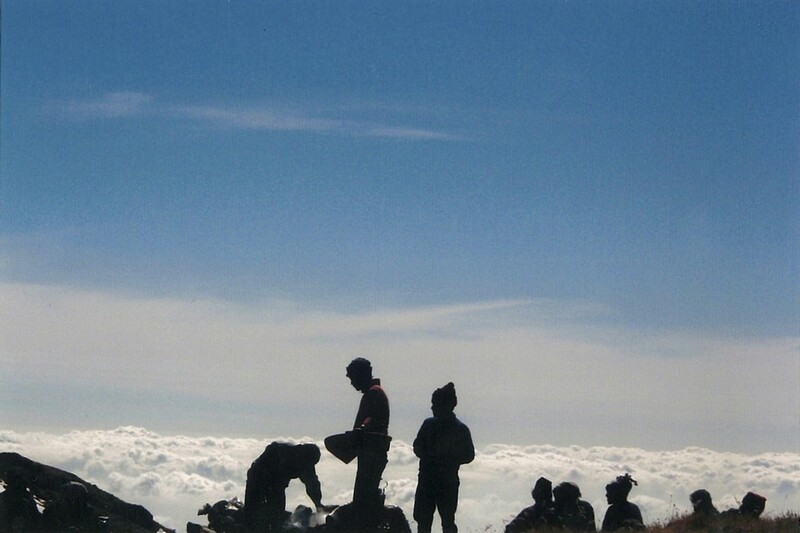 Taplejung airfield is situated on a ridge high above the village and we trek ascending gradually to a pleasant ridge. There is then a hike down to Lal Kharka (meadow) and on to the cultivated fields of Tabawa, where camp can be made in the school grounds. (30 minute flight and 3 hour trek). Day 3 Tabawa to Khesewa (2,100m) The trek makes a long circuitous descent off the mountainside to the terraced fields of Pokora where there is a suspension bridge over the Phawa Khola (river). There is then a long hike through fields, forest and up a gently sloping mountain path to the banjyang (ridge) high above. 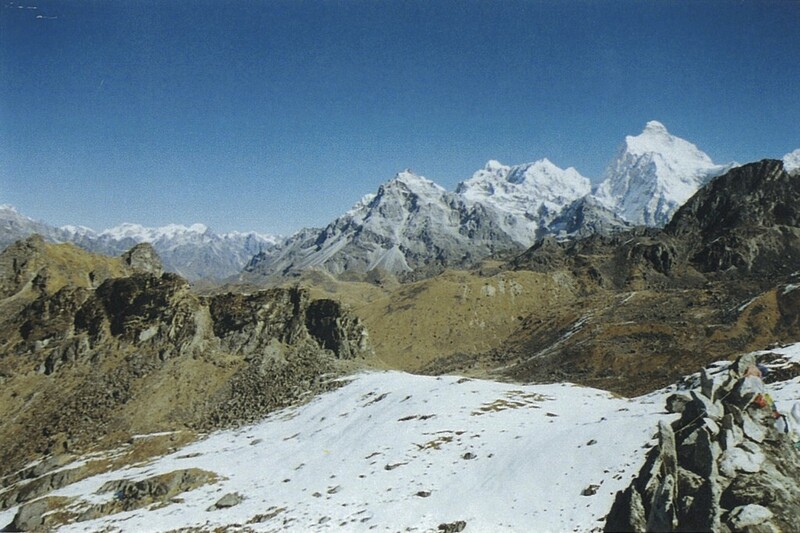 The hike is well worthwhile as the view from the banjyang reveals Kangchenjunga and her satellites in all their glory. It is now possible to identify the individual peaks of the mountains; Yalung Kang on the left, the main summit appearing as a small pyramid, the south summit as a ridge to the right and Jannu as an obvious tower well off to the left and slightly in front of the main group. The trek to Khesewa is down a gentle path and the views gradually disappear behind the intervening ridges as altitude is lost. Camp can be made in or near the village. This is truly marvellous country with line upon line of forested ridges providing a wonderful contrast and backdrop to the rich flora and cultivated fields of the valleys. (5 hour trek). Day 4 Khesewa to Mamanke (1,800m) The trek continues its way over or around the great ridges on the west side of the Kabeli Khola, crossing its tributaries on the way, passing through terraced fields and forested areas. The one really good view is of Jannu from the ridge crest at Ponpe Dhara. We camp in fields near the sprawling village of Mamanke. (6 hour trek). Day 5 Mamanke to Yamphudin (2,150m) More hiking up and down on the hillsides above the Kabeli Khola until the trek descends some stone steps to the river itself. 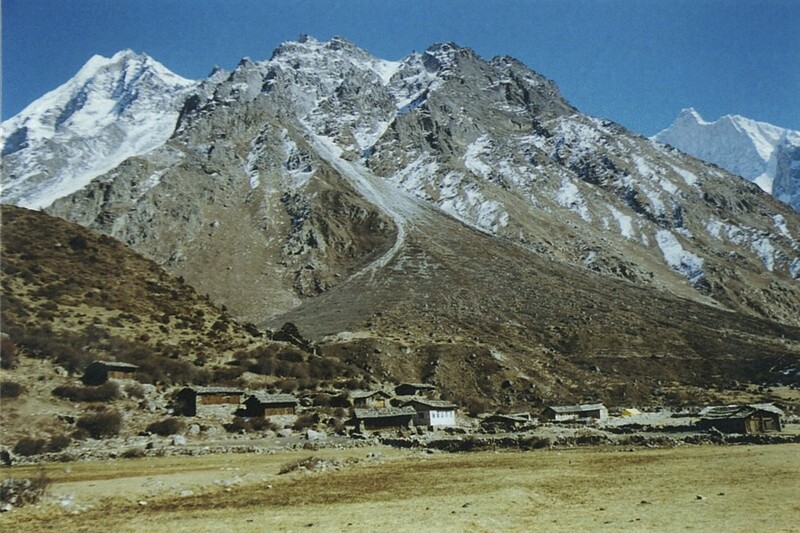 A gradual hike up to a ridge and then through fields brings you to the last permanent settlement, Yamphudin. Good camping can be found in the fields beside the river on the south side of the village. (5 hour trek). 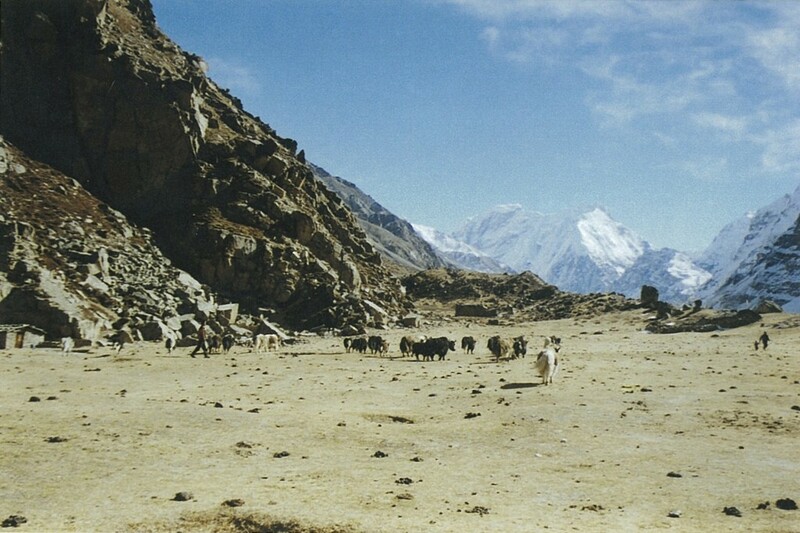 Day 6 Yamphudin to Lamite (2,920m) After 4 days trekking through cultivated areas we at last leave civilization behind. 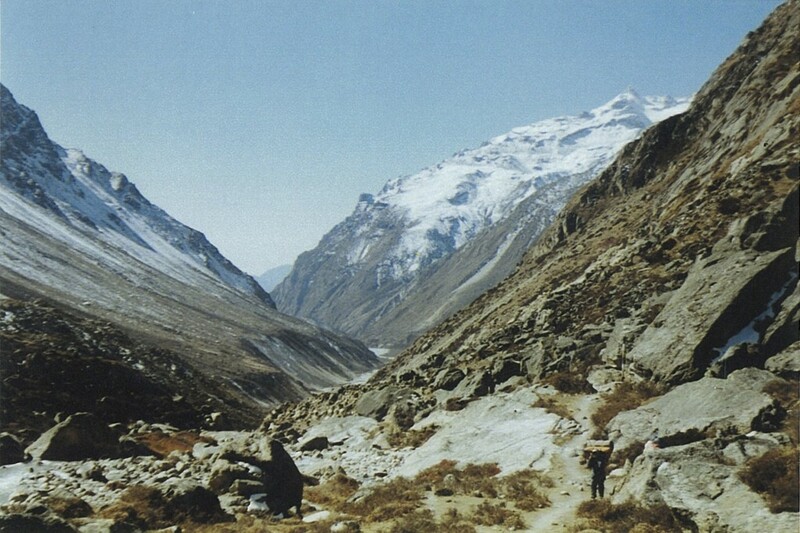 The trek first crosses the Omje Khola before we hike up a spur beside it leading to a high valley and subsequently to a broad grassy col high above. 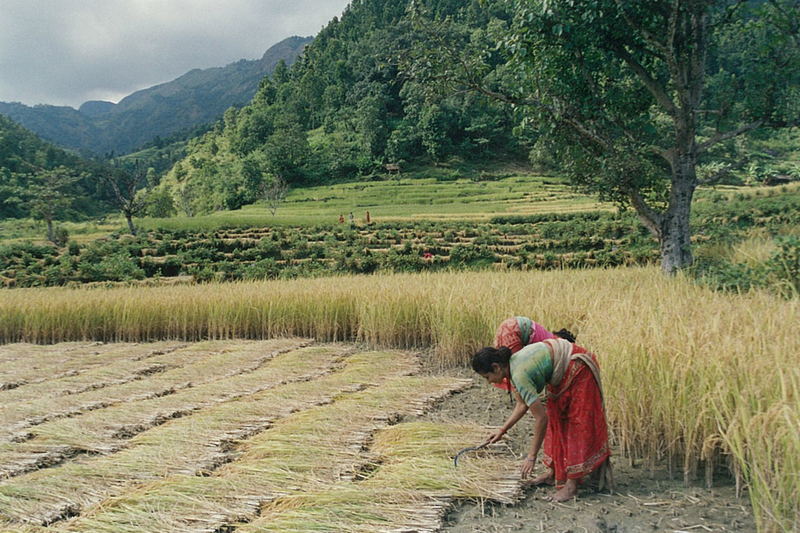 Reaching the col reveals the immense and unspoilt forests of the upper Omje Khola Valley. There follows a wonderful and steady hike down through birch and fir forest, often on a carpet of leaves and beneath branches swathed with lichen. The river is crossed once again on a small log bridge to a small site known as ‘Jungle Camp’. (3 to 4 hour trek). Day 7 Lamite to Torongtan (2,900m) From Lamite the trek begins a long ascent to cross the Deorali Danda (ridge), 3,300m, winding its way uphill, steeply at first, through rhododendron thickets to a clearing at Chittre. 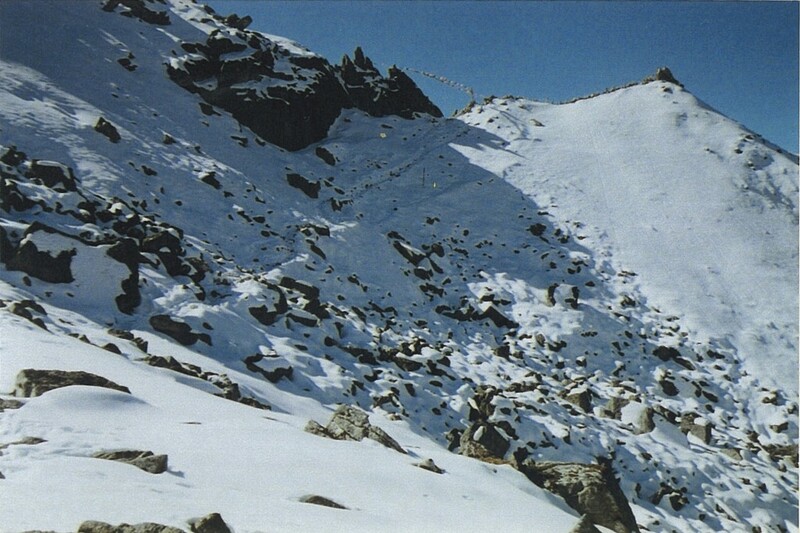 The col on the danda is broad and contains a small pool and there are views of the summit of Jannu. The initial part of the hike down from the ridge has been subject to landslide and requires care, the drop is considerable! 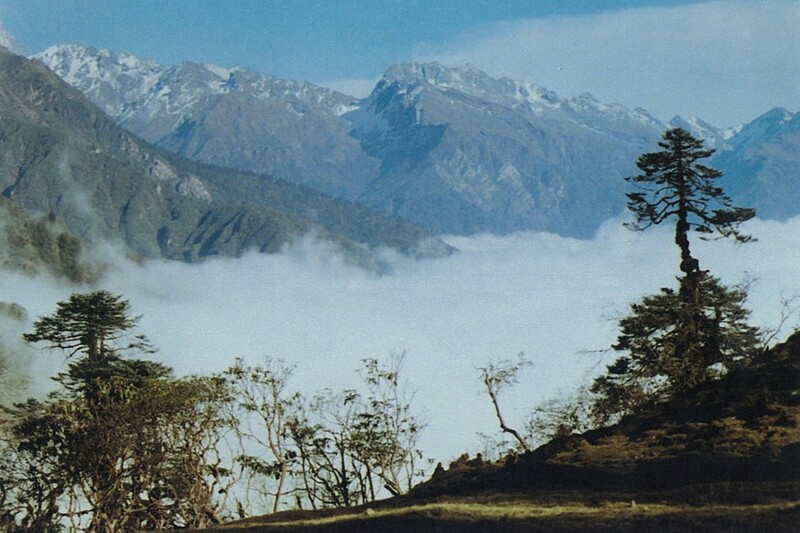 Kangchenjunga reveals itself at several points on this trek, which finally re-enters the forest for a pleasant and steady hike down to the banks of the Simbua Khola. A trek of about ½ hour along the riverbank leads to a small bridge which provides access to the north bank and a clearing known as Torongtan, we camp here. (6 hour trek). Day 8 Torongtan to Tseram (3,700m) The lower Lalung Valley is thickly forested with pine and rhododendron and the trek follows the river northeast towards its source on the Yalung Glacier. Delightful views of the snowy mountains can be seen ahead, as the trek follows the ever-widening riverbed, with the terminal moraine of the Yalung Glacier, overlooked by the peaks of Talung, Kabru and Rathong, eventually coming into view. Tseram is a pleasant grassy campsite on a small terrace above the north bank of the river. (5 hour trek). Day 9 Tseram to Ramze (4,500m) A steep moraine slope blocks the trek out of Tseram and it’s necessary to hike down to the riverbed to avoid it before the trek enters a final forested area to reach a stone hut at Yalung Bara. The trek ahead is typical of the high valleys of Nepal as the path wanders its way along a shallow ablated valley with a great white mass of mountains dominating the view ahead. The glacier itself is finally revealed at Lapsang, along with the Rathong La pass and the beautifully ice-fluted peak of Koktang, and a glacial lake nearby provides the perfect foreground to the high mountains beyond. The trek levels beyond Lapsang and it is a pleasant and inspiring hike to Ramze where camp can be made on the grassy pastures beside 2 small stone huts. (6 hour trek). Day 10 Ramze to Oktang (5,000m) and return to Lapsang (4,100m) From Ramze we make a day’s trek to obtain views of the south face of Kangchenjunga. Beyond Ramze the glacier turns north and, after about 1 hour’s hiking on level ground, as we round a corner a tremendous view opens up to include the entire south and west sides of Kangchenjunga. After an hour’s hike a small track leads onto the lateral moraine of the Yalung Glacier and to a chorten from where there are unsurpassed views of Kangchenjunga’s main summit, Yalung Kang and Kambachen Peak. The trek then descends to a small clearing at Oktang from where further exploration will reveal the long northeast ridge of Jannu. After returning to Ramze it is only about 1 hour’s trekking to Lapsang, a good base camp for crossing Mirgin La. (5 hour trek). Day 12 Boulder Kharka via Sinion La (4,050) to Ghunsa (3,500m) We trek across the narrow rocky breach of the Sinion La and hike the southern flank of the ridge, on a good trail with superb views, to Tama Lase La, 3,900m, on the shoulder of the ridge. A long trek down now follows through beautiful forest to a clearing on the lip of the Yamatori Valley, from here we continue hiking down through pine and rhododendron forest to Ghunsa, a well-kept village of some 30 stone houses plus police post and small Tibetan monastery. There is an excellent campsite in open woodland a little beyond the village. (6 hour trek). Day 13 Ghunsa to Kambachen (4,000m) The trek follows the floor of the valley beside the blue-green waters of the infant Ghunsa Khola through scrub, rhododendron and juniper. 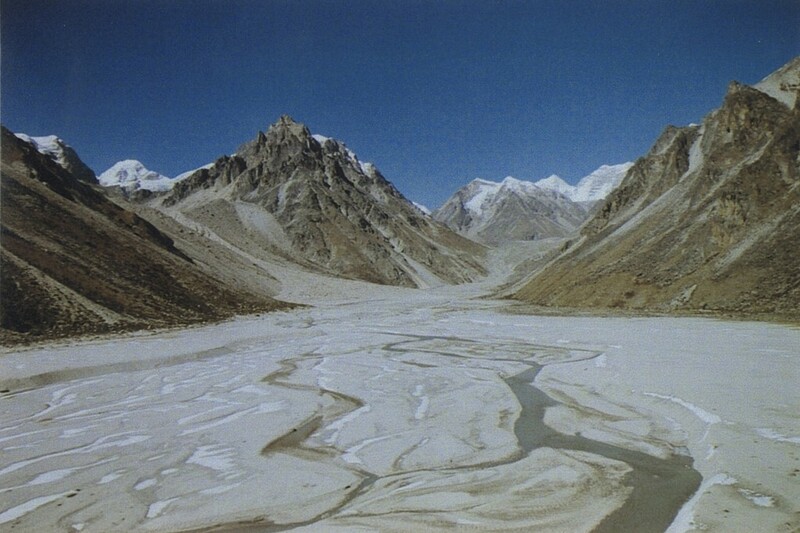 The terminal moraine of the Jannu glacier can be seen clearly ahead, although there is only the occasional glimpse of a snow-covered peak, and, when the moraine is reached, a small bridge crosses the river to a tiny grassy clearing known as Rhambuk Kharka. The slopes above here are subject to landslide and rockfall and great care is needed to negotiate a steep traverse across one very large affected area. 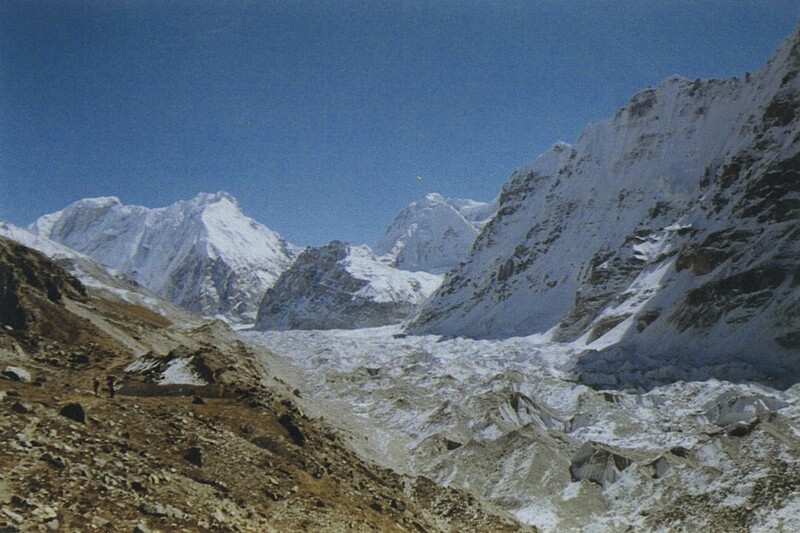 The views to the north and east gradually open out to include the peaks of Phole, Sobithonge and Jannu rising majestically above the moraines of the Jannu Glacier. Beyond the landslide the trek levels out, traverses the hillside and finally we hike down to the small summer settlement of Kambachen. Jannu is hidden from view at Kambachen, but the Sharphu group is now visible at the head of the valley and the broad fields provide plenty of useful campsites. (5 hour trek). Day 14 Rest Day It is worth taking an extra day at Kambachen to give the porters time to prepare for the walk-in to base camp and for trekkers to hike up the hill above the village for stunning views of Jannu. 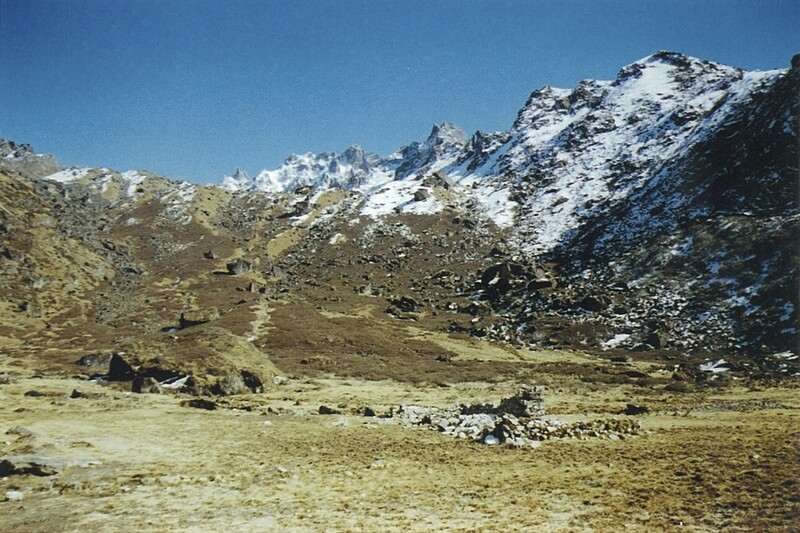 (There is an optional trek toward Jannu Base Camp). Day 15 Kambachen to Lhonak (4,680m) The rough, but easy, trek continues up the west bank of the river, first across a small boulder field and then we hike up a short snow slope to a kharka (meadow) at Ramtang. The view ahead becomes increasingly impressive but attention is drawn to the upper reaches of the Ramtang Glacier which feeds off Kambachen, the mighty western outlier of the Kangchenjunga massif. Another hour of level hiking leads to the snout of the Kangchenjunga Glacier across whose moraines rise Pyramid, Tent and Nepal peaks. The terminal moraine and the river from the Lhonak Glacier enter from the north but present only a minor obstruction to access onto the level sandy and grassy plains at Lhonak. It can be a windy spot so the best campsite is on the grass close to the hillsides. There are wonderful mountain views in all directions with the ice flutings of Wedge Peak and the snowy ramparts of Nepal and Tent Peaks presenting the ideal backdrop for a colourful sunset. (6 hour trek). Day 16 Lhonak to Pangpema (5,030m) The trek to Pangpema is on a deceptively rising track which follows a shelf alongside the lateral moraine of the Kangchenjunga Glacier. The views are stunning as progress is made up the valley with Wedge, Nepal, Tent and Pyramid Peaks all visible, along with the Sharphu peaks dominating the horizon. As Pangpema is reached the view to the south opens up to reveal the Twins and, finally, the great north faces of Kangchenjunga and Yalung Kang. 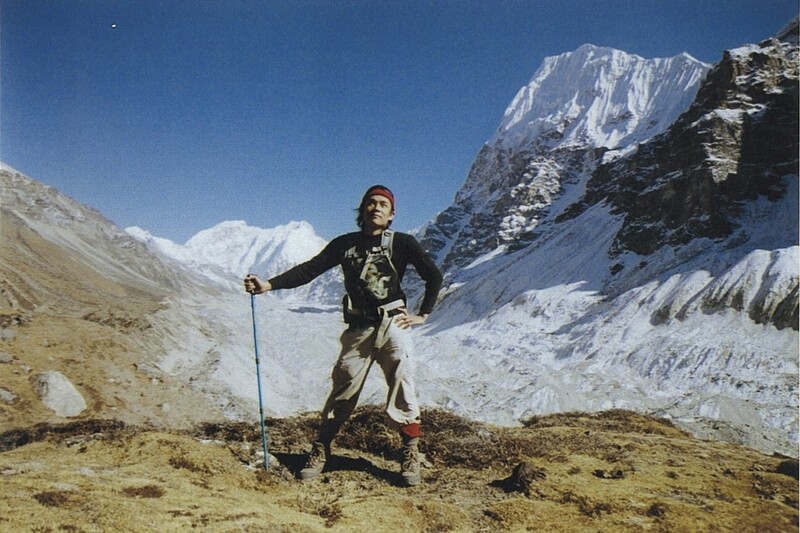 Pangpema is on a small grassy shelf above the glacier, prayer flags adorn a large boulder and there is a small plaque in memory of an American climber, Chris Chandler. (4 to 5 hour trek). Day 17 Rest Day and Short Trek Back to Lhonak (4,680m) After an early morning hike up the hill above we can relax and enjoy the atmosphere at Kangchenjunga’s north base camp. Ask your guide for advice on where to hike. We may well trek back to Lhonak to make the following day easier. (3 hour trek). Day 18 Lhonak to Kambachen (4,000m) We trek back. (4 hour trek). Day 19 Kambachen to Kyapra (2,640m) Back down through the stark mountainous scenery we hike past Ghunsa and on for another 45 minutes to Phole, where the valley narrows. 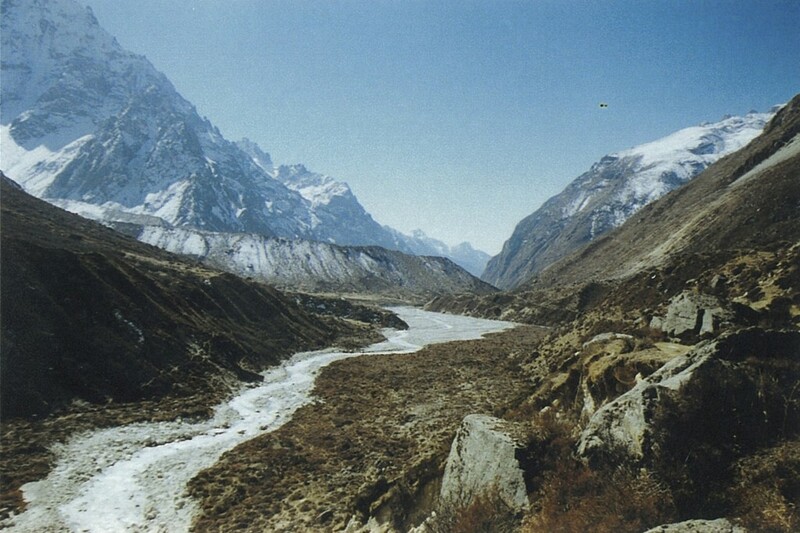 It now becomes forested and the trek keeps to the west bank of the Ghunsa Khola. There is a good campsite at a small clearing at Kyapra beside a cluster of Buddhist stone huts. (7 hour trek). Day 20 Kyapra to Tangep (1,700m) This is a day of ups and downs as the trek stays close to the bed of the Ghunsa Khola with its many fine waterfalls and deep pools. The vegetation slowly changes as the altitude decreases and the trek penetrates dense forests of bamboo, fir and scattered rhododendron. We arrive at some clearings known locally as Tangep to camp. (4 or 5 hour trek). Day 21 Tangep to Sakanthon (1,700m) We trek along a steep and twisting path to the small village of Amjilassa. The steepness of the hillside has relented here enough to allow some cultivation and the view down the valley is stunning – the distant Ghunsa Khola snaking like a silver ribbon against the backdrop of the steep cliffs. There is a spectacular hike traversing past several waterfalls on a narrow, but well engineered, path. From the rocky traverse a steep hike down is made into the deep, narrow and steep-sided valley. There is a small campsite on a grassy shelf above the river. (4 hour trek). Day 22 Sakanthon to Sinwa (3,090m) After ½ hour we hike across a bridge and reach the confluence of the Ghunsa and Tamur Kholas. 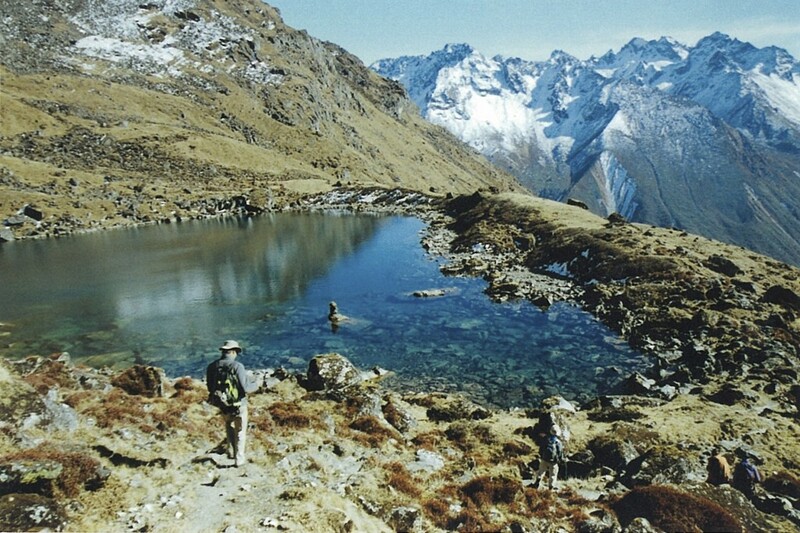 The valley sides are steep and the trek traverses high above the Tamur River. The small village of Helok is located at the confluence of the Tamur and Simbua Kholas and there is a good bridge across the north bank. In the heat of the afternoon it is tempting to camp at one of the many clearings beside the river, but we trek on through the beautiful rock gorges hiking across steep forested hillsides, past the village of Chiruwa to camp on grass beside the river near the village of Sinwa. (5 hour trek). 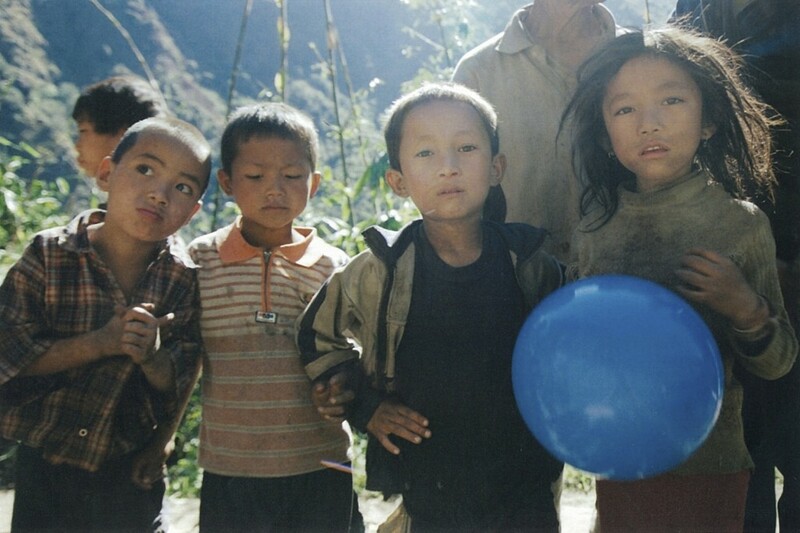 Day 23 Sinwa to Dobhan (810m) This is an easy day’s trek alongside the Tamur Khola through numerous paddy fields. After crossing the large suspension bridge we hike into the village of Dobhan with its street of well-stocked shops. There is a large campsite at Dobhan beside the bridge. A hydroelectric scheme now supplies power to the village. (4 hour trek). Day 24 Dobhan to Taplejung (1,800m) Beyond the bridge over the Tamur Khola the trek splits and the right hand branch begins a long zigzag course up the hillside to Taplejung. We camp as before. (4 hour trek). Day 25 Fly to Kathmandu via Biritnagar We return to ‘civilization’ full of a profound sense of achievement and longing for a hot bath, a beer and some of Kathmandu’s culinary delights. We hope you’ve had a great trek, had some adventures, have fond memories to take home and, of course, we look forward to trekking with you again on your return to Nepal. Price US$ 2,600 plus accommodation in Kathmandu. Price includes Airport pick-ups and drop-offs. 1 night in Biritnagar at a 3 star hotel. All inclusive trek costs; all camping equipment, breakfast, lunch, dinner, trekking and park permit fees, guide and necessary porters and all their costs such as transportation, accommodation, food, equipment, insurance etc. All flights and other transport. Day 11 – Fancy a Dip?